Well, this isn’t the best photograph ever, but this is the pen that I’ve been wanting to add to my collection for the longest. I just finished the restoration of it this morning so I thought it would be fitting to add it to the blog and make it my first post. 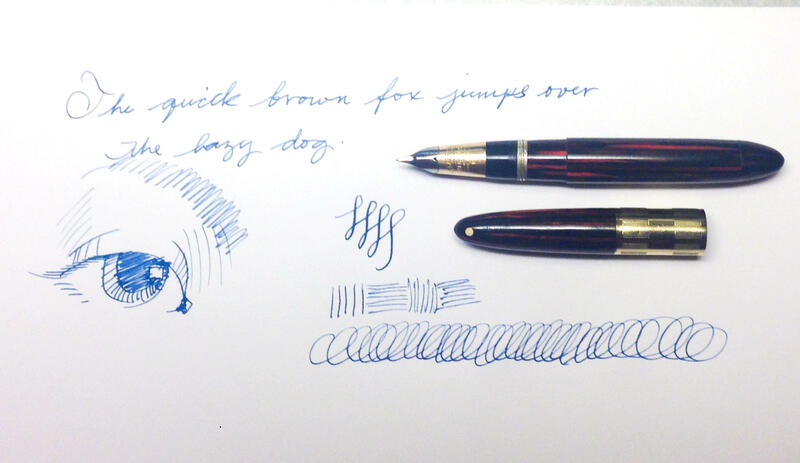 In the early 1940’s Sheaffer came up with this extremely innovative nib design. They introduced it in 1942 (if I remember correctly) in the Triumph pen. This is the Tuckaway version of that pen and it was sold by Sheaffer through the 40’s. It uses a vacuum filling system that creates a vacuum in the barrel on the down stroke, which is released at the bottom of the stroke and draws ink into the barrel. This is one of my favorite filling systems, though it is sometimes a pain to restore. This one went together really well. There were some flow issues with the nib that I’ve fixed. I also broke the feed trying to get the nib unit out (this isn’t a problem for me on this pen since it works fine and I’m not selling it).